Hot this week: Burying the Kennewick controversy once and for all? If you missed our free course, here is your chance to learn a bit about art crime. The course starts on 6 June, but after that you can move at your own pace. I’m looking forward to it. Should we treat Vigango like human remains? ARE they human remains? She admitted to conspiring with a gallery manager in Colorado to steal artworks including this famous photo. Babacar M’Bow was dismissed in response to sexual harassment allegations. He is suing saying that he was denied due process. One might question why the skulls were sitting there in the first place, but they were not for sale and were stolen. The bill now moves on to the president for signature. The rusted gears and so on were being stored outside of the structure which, presumably, is why they were taken. He is Native American and this the Army Corps of Engineers is working towards with tribes to coordinate a burial. The piece erected at Rafina for the Olympic torch relay was stolen, likely for scrap metal. The castle was found to be in a state of neglect due to vandalism. This is yet another in a string of church art robberies in the region. It is possible that this is an organized gang. An alarming spate of church thefts in the Zamora region. Contrary to what other articles are implying, this article says that art sorts are not leaving the Geneva Freeport due to scandal. A painful story: if this is accurate it seems the police were not taking the national museum theft seriously. A feature on, well, me! It appears as if the burglars felt guilty about taking the family heirlooms and returned them. The wooden sculpture was cut at its base. Allegations that the UK government has some hand in museum trustee appointment. The Great Tapestry of Scotland features 160 separate panels, the Roslin Chapel one was stolen last year. The remains were formally handed back to traditional owners who are temporarily housing him at the National Museum and he remains in limbo. Some facts and figures on idol theft and return from the India Pride Project. Apparently after one of the thieves tractor was seized his financial situation became such that he conspired to steal the idol with a friend. The saga continues in the missing ancient coin case: the “lost” probe report has been found. Idols of Rama, Sita, Lakshmana, and Hanuman were taken. They were “planning to sell three Panchaloha idols stolen from a Shiva temple near Ponneri”. “Miners have plundered idols, sculptures and remains of ancient temples dating back to 10th and 11th century BC buried near Chitrakoot’s Sarbhanga ashram”. The pieces taken were about 150 years old. The pieces appear to have been stolen from historic forts and other sites. 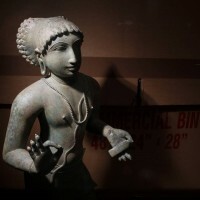 Vijay Kumar looks at India’s commitment to the return of stolen cultural objects. The dagger was stolen earlier this week by two members of cleaning staff and it has been recovered. Looking at a whole stupa now in the UK and questioning why Kohinoor is a priority. A true tragedy. “In the next two days the extent of damage at the national museum will be know”. The fire started at 1:45 AM on the top floors of the museum but the cause has not been determined. A tragic loss. This is the piece seized during Asia Art Week. Presumably because the dealer, Tatsuzo Kaku, pled guilty, the piece no longer needed to be held. A Syrian lawyer who was detained allegedly brought the object from Syria. The gold covered and mummified Fu Hou has been fitted with an anti theft device. It is interesting to see that the carved ivory all display Chinese themes. Plans afoot to move the jewel heist vault to the Museum of London as a public exhibit. Walking cops through the Met and quizzing them about what they saw as memory practice. The administration probably thinks they’re just flowers. The wise was stolen during a 2014 at Christmas.